tbaker2500 wrote: Hey, hamsterboobs is back! Aw shucks, ya'll make me blush! 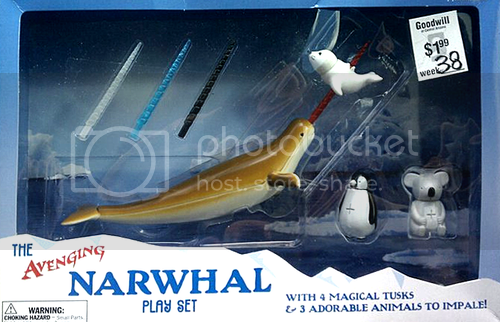 Either way, that darn Narwhal gives me the willies, no matter how much it can impale, whether its a Koala or Mongoose... I'd turn tail and run if I saw that face first thing in the morning! Dunno how a koala got to tha Arctic. Topic: Still looking for the perfect Holiday Gift? Re: Still looking for the perfect Holiday Gift? Hey! Where did you find pictures of me the day I auditioned for Return of the Jedi?!!!? I was told they were all destroyed! Oooo There are more of them? I just got this one out of the library on Wednesday! Poor Dolores, has a serious case of Sarcoptic mange and is taking out all the other female bear competition with her. Not only does she have the stare going for her, but a highly contagious skin disease. ROU Killing Time wrote: Nominates potatohamster for most eye-catching avatar on DC. Don't look too close. That hamster is a literal eye-catcher. Can we have a camera mounted on that hamster? Haha, Aw, I'm feeling some awkward love. YES! I second the motion to super glue a micro camera to that hamster! As if I don't already spend enough time fiddling around on the internet. Thanks Tom! This is awesome! Topic: Don't worry everyone - the Montauk Monster is OK. Yes!!! I agree with Kevin! Can we get Drabblecast members to dress up as said cereal box characters and have live action deathmatch(es)?!?!?! I'm a fruity pebbles kinda gal. I could eat fruity pebbles almost every morning for the rest of my life if I knew I wasn't going to go into diabetic shock. Don't get me wrong, I love me some Cap'n, but it tends to slice the roof of my mouth. Haha, that is so a "Randy Jackson" comment. I despise american idol, but that is exactly what he says. Also loved it in its entirety. Couldn't have been more perfect. Even made me tear up a bit! MAJOR Kudos to Mr. Sherman! I must admit, the last few episodes, Norm has sounded a lot less cynical and there seems to be a "bounce" in his voice. I must agree with cammo, I think Norm has a lady friend that the other editors aren't paying for.